Ruthann Froberg is a Martin School MPA student who will enter her second year this fall. 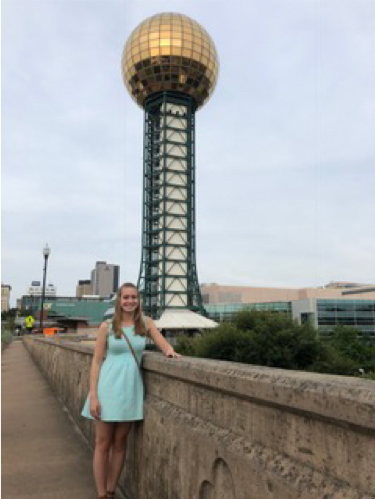 This summer, she completed her internship, a required component of the MPA program, in Knoxville, Tennessee. She shares her experiences below. This summer has been a fun and interesting break from my MPA coursework. The Community Action Council’s (CAC) Office on Aging, my internship location, is a part of the Knox County, Tennessee government that coordinates programming and resources for seniors. Their programs include Mobile Meals, a senior center, Grandparents as Parents, job support, and housing assistance. In general, I work at the Office on Aging with the Grandparents as Parents (GAP) director for half of the week and at the O’Connor Senior Center for the rest of the week. The work is a mixture of legislative and topical research, writing, data analysis, and meetings. I have really enjoyed the opportunity to learn in-depth about specific social issues, to interact with seniors at O’Connor, and to learn from the Office on Aging workers. And it has been fun to spend the summer in Knoxville! Most significantly, this summer I have learned more about grandfamilies, families where grandparents (or other family members or family friends) have taken in children when the parents are not able to care for them. There are more than 2.6 million grandparents in the U.S. who are solely responsible for their grandchildren. Almost 4,000 of those grandparents are in Knox County where the Office on Aging is situated (statistics per the American Community Survey of 2016). A lot of the work I am doing this summer is to support the GAP director with any research and outreach she does in order to strengthen the efficacy of the program. Many of these grandparents search for economic and social support because they are unexpectedly parenting for a second time in their lives. I have appreciated the opportunity to learn about responses to this social issue and to observe how a county office and program director address such issues in their community My experience at the Office on Aging has helped affirm how much I love working with seniors and how much I want to spend my career advocating for their needs and concerns.